In November of 1889, two women set off to see if they could beat the record of Jules Verne’s imaginary hero, Phileas Fogg (who went around the world in 80 days). Nellie Bly, a reporter for the New York World, set off first, boarding the steamship Augusta Victoria and beginning her 40,070 kilometer journey eastward. 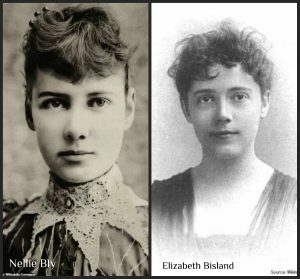 Not to be outdone, the publication Cosmopolitan chose its own reporter, Elizabeth Bisland, to see if she could beat Nellie Bly to the new record. Six hours after being recruited, Bisland left New York, traveling westward. Their journeys were avidly followed by the public, although Bly received more attention (likely due to the fact that the New York World was a more sensationalistic publication and was also published more often than Cosmopolitan). The two women traveled by steamship and rail, making their way through the United States, Europe and Asia and across several oceans. Sending infrequent messages to their respective newspapers via mail and telegram, they endured heat, cold, and even seasickness. While Bly was told at one point by a steamship official that Bisland had beaten her, as it turned out, Bly ultimately triumphed over Bisland, who had been forced to catch a slow-going steamer ship towards the end of her journey. Bly also had the advantage of taking a specially chartered train to complete her journey, arriving at her final destination with a total travel time of 72 days, 6 hours and 11 minutes. Why so precise? The World had advertised a contest to guess the exact moment she would arrive. And no, there doesn’t seem to be a record of anyone who won this contest. Bisland wound up completing her journey in 76 ½ days. Both women, though, were ahead of Phileas Fogg’s fictional journey! Enduring seasickness, rail travel that wasn’t always comfortable, and wearing more layers of clothing than most of us do these days, these women showed that a journey around the world could be accomplished. Especially in the context of how the world was in 1889, their travels were significant achievements. If you would like to learn more about these women and their amazing travels, we suggest Eighty Days: Nellie Bly and Elizabeth Bisland's History-making Race Around the World by Matthew Goodman. This fast-paced book gives all of the details, making you feel like you’re on the journey, yourself. And, if you’re daring and want to try an around-the-world journey of your own, the History and Languages Room is your one-stop-shop! We have a wealth of travel books on our shelves, as well as phrasebooks and materials if you’re learning a new language. Whether you’re planning a short jaunt or a long adventure, we’re happy to help! Just ask any of our friendly staff in the History and Languages room.